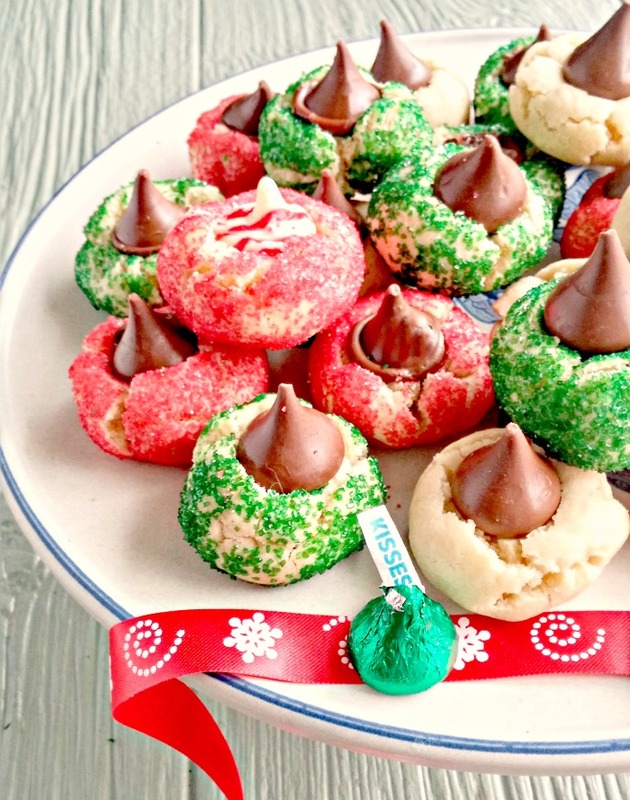 These holiday kiss cookies are perfect for your annual cookie swap. During the normal part of the year, I really keep my intake of sugar to a minimum. But during the holidays, the cookie fairy seems to sit soundly on both shoulders tempting me and prodding me to make one cookie recipe after another. 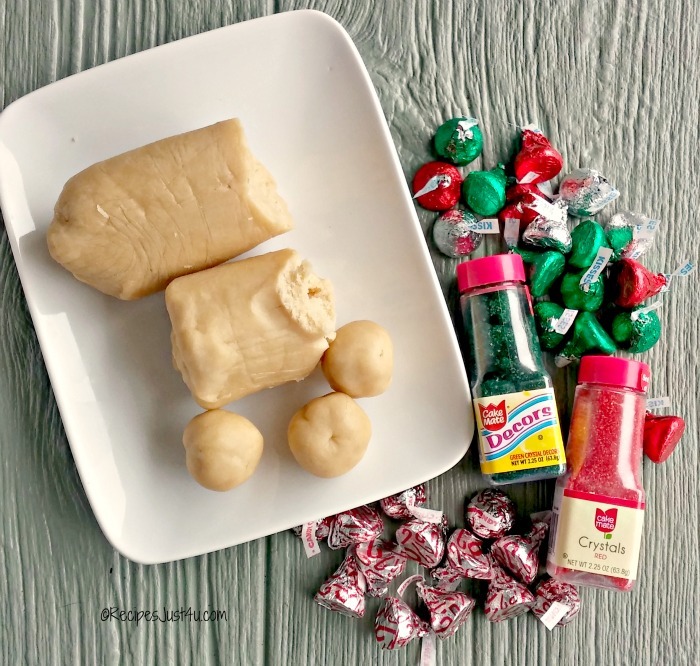 The cookies start out with my basic sugar cookie recipe. It is one that I use all during the holidays. I make a huge batch and freeze it in long logs until I need it for cookies. 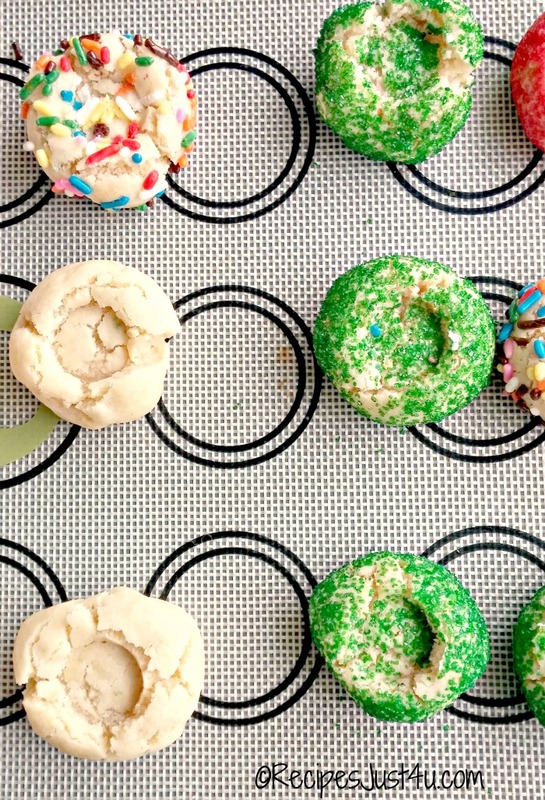 Whenever I have a yen to make some cookies, I just take a roll of the freezer and either slice it and bake, roll it and cut with cookie cutters, or roll it into balls as I do in this recipe. For these cookies, I use half of my normal recipe proportions, or two logs. Once the cookie dough is ready, I gather up the rest of my ingredients. Today I used both Peppermint Kisses and plain Milk Chocolate Kisses. 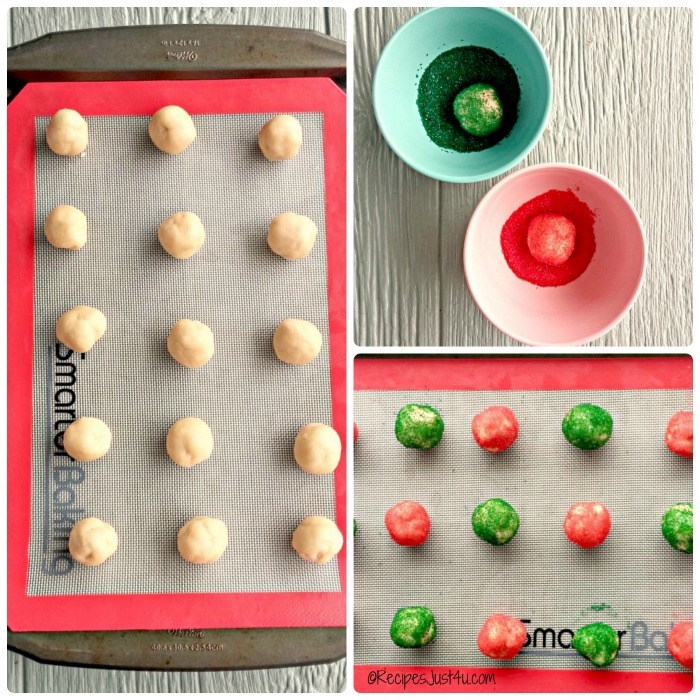 Next, I just rolled the dough into 1 1/4 inch balls and placed them on a silicone mat on a large cookie sheet. Now comes the creative part. Some of the balls I leave just as plain Janes. Some get rolled in a bowl of sprinkles and others get a coating of red or green sugar crystals. The possibilites are endless really. All cook up well and keep the coating intact in the oven. The cookies need to cook for 10-12 minutes. Don’t let them get too crispy, or they will be hard to shape for the kisses later. Mine were just cooked and just a tiny bit solid on the outside. 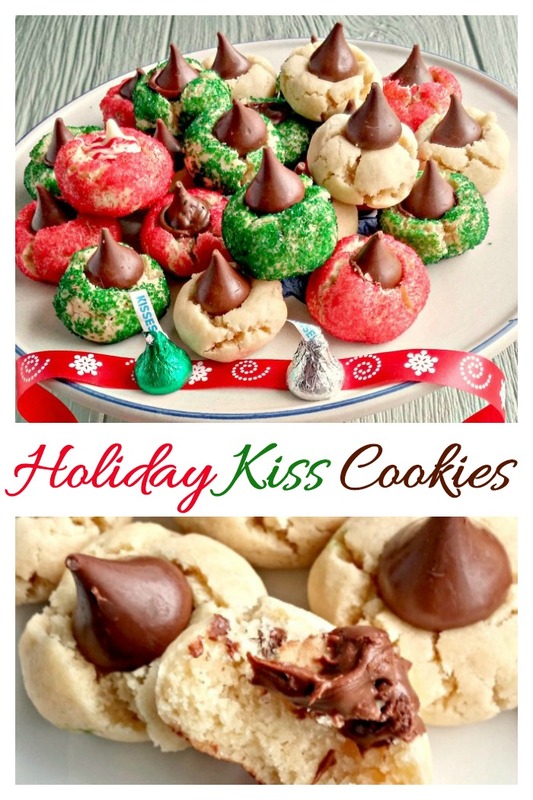 I used a small bottle top to make an indentation in the middle of each cookie while they were still warm and then let them cool for 5 minutes before adding the kiss. If you add them too soon they will just melt, so be patient. 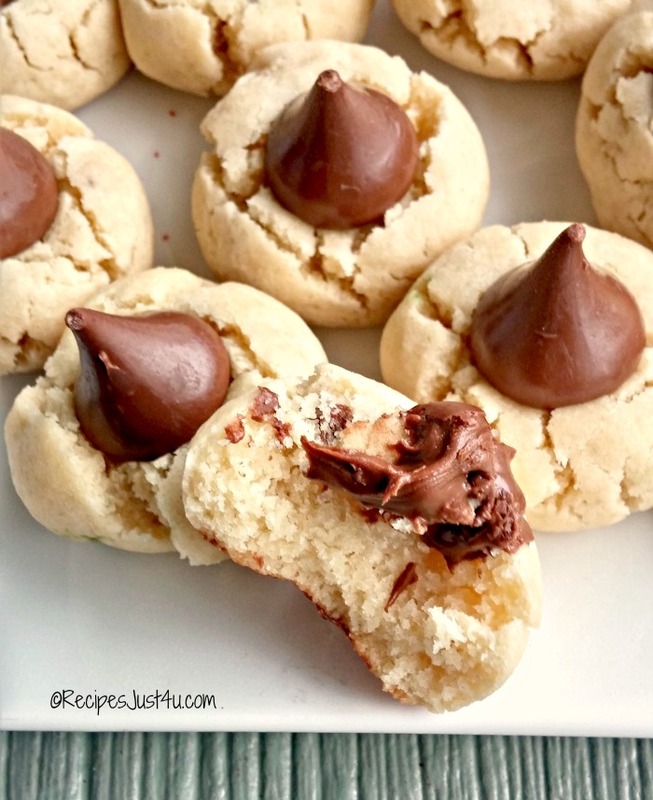 If you time the candy kiss just right, it will get slightly soft on the bottom and will stick to the cookie. If you are not lucky, you can use a frosting tip that will hold them in place. 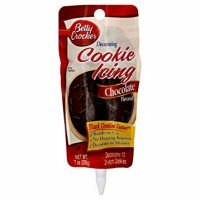 Just use a tube of Betty Crocker chocolate icing and add a dab of it under each kiss and then place them in the indentation and they will all cpme out beautifully. What I love about this recipe is that it is so versatile. You can decorate them for Christmas as I did and use any kind of festive sprinkles and the peppermint kisses too. 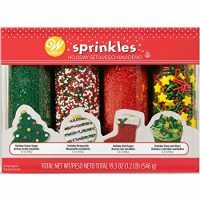 Or, when the holidays are done, you can make them year round without the sprinkles and they will be a favorite in your house, as they are in mine. Many holiday cookies are overly sweet which is great but sometimes I want the topping to give the flavor to the cookie. These are perfect, I think. 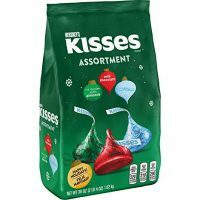 They have a bit of a crunch when you bit into them and the delicious milk chocolate kiss gives just the right amount of richness without giving you too much of a sugar rush. The cookies make a perfect homemade cookie gift, and is the ideal choice for your annual cookie swap. I made a few batches of them, because I just know they won’t last long at my house! 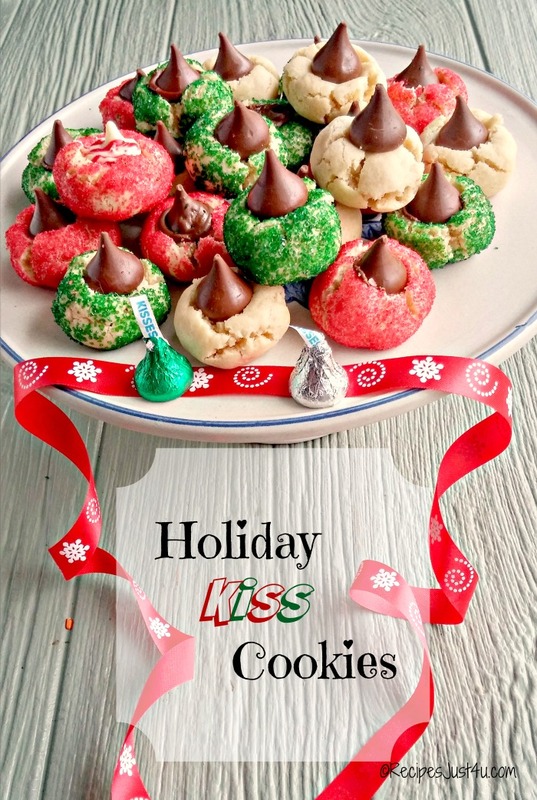 Would you like a reminder of this recipe for these holiday kiss cookies? Just pin this image to one of your Pinterest Holiday boards so that you can easily find it later. 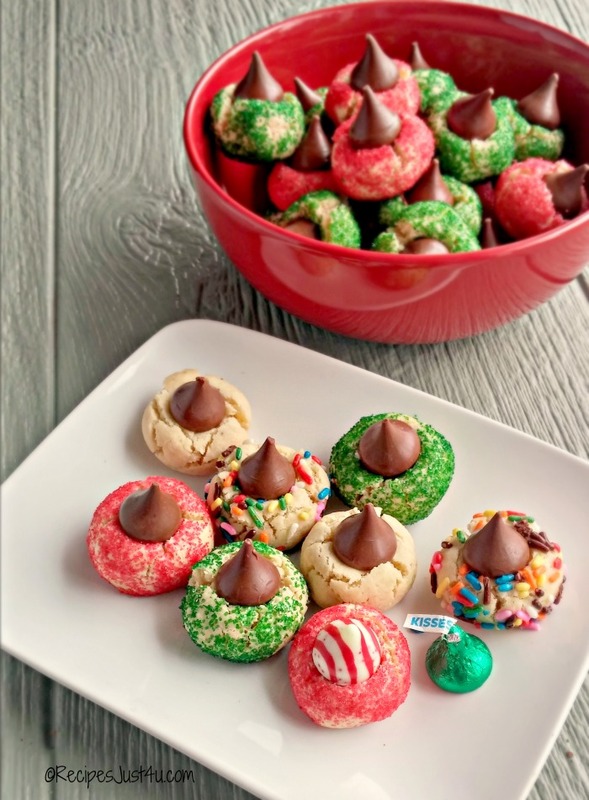 These deliciously festive holiday sugar cookies are rolled in sprinkles and topped with a sweet candy kiss. Whisk together the flour, baking soda and salt in a large bowl and set it aside. In the bowl of a stand mixer, cream the butter and sugar. Add the eggs, one at a time and then the vanilla extract. Mix well until a stiff dough forms. Take spoonfuls of the dough and form it into balls about 1 1/4 inch in size. You can either leave the balls plain, or roll them in festive sprinkles or sugar crystal. Bake 10-12 minutes in a 350 º F oven . 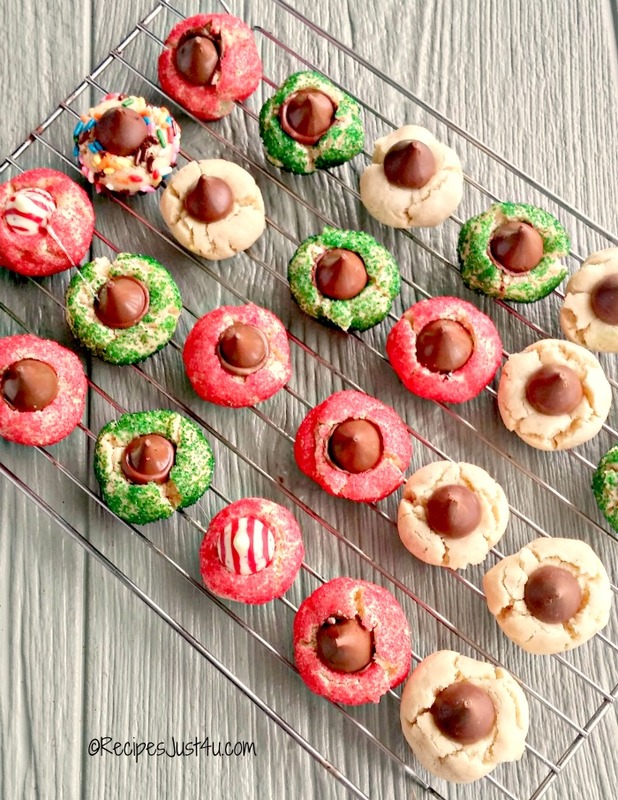 Move to a wired rack and make an indention in the middle of each cookie to flatten it slightly. Let cool for at least 5 minutes. 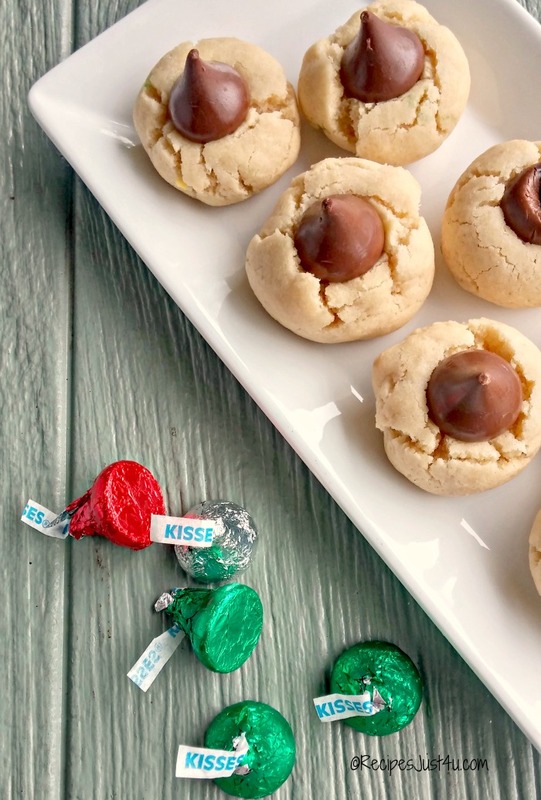 Add a dab of chocolate frosting to the bottom of each candy kiss and place in the center of the cookie. Enjoy! 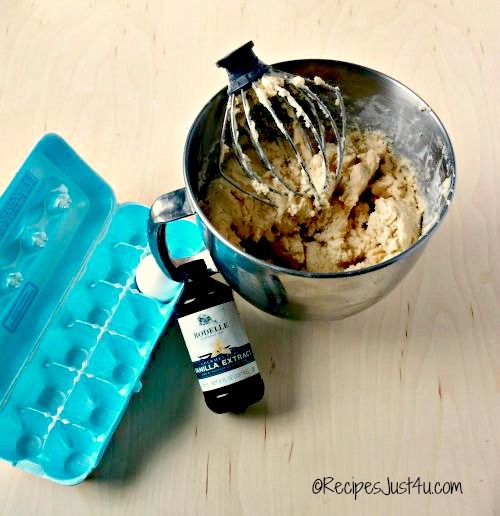 Can you make the dough a few days ahead and keep in the fridge ??? What a great recipe using real butter. YUM. I will have to try this recipe one day for sure. 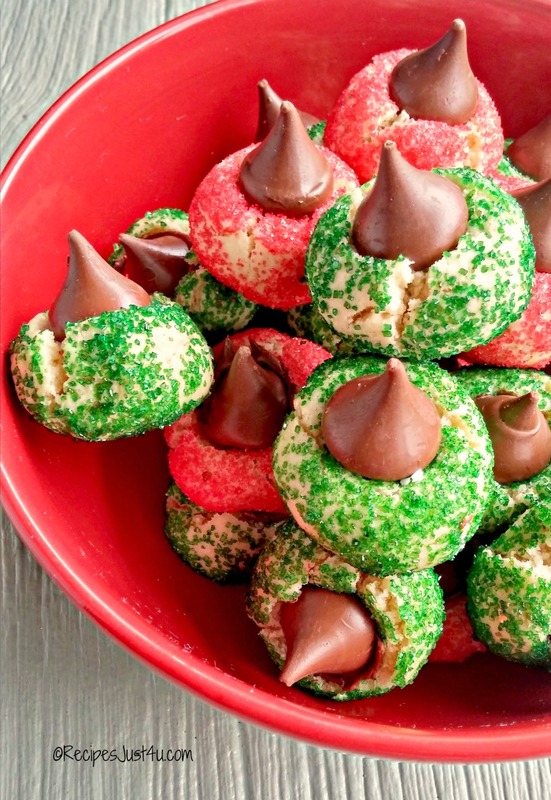 I gave them as homemade Christmas gifts and they were a big hit. You absolutely have to stop showing these kinds of recipes! They look so good (and I wondered how you put the kisses on top without them melting so I had to scroll through the whole thing). Awww…temptation is good this time of the year. I melted them the last time I made them, so I got smart this year!